Posted on April 24, 2015 in Industry by Anneliese Herbosa. On a scale from Twitter to Blogger, Medium comes in the middle. From the folks who brought you both Twitter and Blogger, this publishing platform that bodes well with both shortform and longform content caters to a wide range of users—from the least experienced aspiring writers to the most reputable of publishers. It’s been seen as a powerful storytelling space, inviting just about anyone to share their stories (hence their tagline). Medium’s sleek design makes it super easy for newcomers to the craft of blogging to dive right in. As for seasoned bloggers who are more accustomed to navigating clunky and complex CMSs, its minimalist yet full-text editor is a sigh of relief (and really pretty to look at). Here are some Medium best practices any blogger—from amateur to pro—can follow to master this powerful publishing…medium. Your best friend’s younger brother or aunt aren’t the only ones who can do cool things on the Medium. Since it does act as a nice place to showcase longform pieces, thought leaders and industry experts are increasingly taking to Medium to extend their reach and demonstrate their knowledge on a niche topic. For blogging newbies: if you have written a piece that you prefer didn’t show up in search results (say you’re just looking for a space to host your articles), you can keep them unlisted. For bloggers looking for feedback: Send your piece to a friend on Medium for review. They’ll be able to add comments known as ‘notes’ straight within Medium. If it’s intended to be a collaborative effort between you and other co-authors, attribution will be given. For independent writers pt. 1: If you want to piggyback on the eyeballs of tailored distribution channels, consider submitting your work to a Medium publication. More on the benefits of this later. For independent writers pt. 2: If you choose to treat Medium as simply an additional writing portfolio where you host your articles without having to worry about which sub-publications they are a part of, that’s fine too. For marketers and brands: If you are a brand (or represent one by being, say, a content marketer), a rising trend within Medium is to publish original or repurposed branded content. When it comes to success metrics within the scope of digital publishing, here at Quietly, we’ve mentioned before that zooming in on session duration and the factors that surround longer time spent on sites (as opposed to looking at pageviews or impressions) alone can offer more value. Medium understands this and this is demonstrated by the Stats page which all users have access to. Users are able to see which of their stories readers read all the way through and can compare those stats with the total amount of views. Medium also shows you where your readers are coming from and offers a list of referral sources. This can give you an idea of where your story performed well when shared on social channels, or cross-promoted on other sites. On top of seeing which of your posts received increased exposure due to external promotion, you are able to see which of your Medium followers showed affinity for your piece. The reach and power behind a single Recommendation on Medium is touched on later. There are many established Medium publications that writers can choose from to submit their content to. To note, the submission policies would vary from one publication to the other depending on the editors overseeing those respective publications. If your content does end up on a publication, it would help your literary work surface the feeds of subscribers to that publication. From an editorial standpoint, Medium also puts you in the driver’s seat and allows you to play the role of Editor. Curate a publication focused on whatever topics you are an expert in. This appeals to both individual influencers looking to step up their thought leadership game on a personal level, as well as brands who want to position themselves as thought leaders in a specific topic or industry. Here are the publications related to marketing. Brands are able to take it a step further and create a branded publication specific to only their brand. This allows brands to take ownership of their brand name and voice within Medium while providing tailored content to their loyal audiences. Tesla‘s presence on Medium is a great example of this. 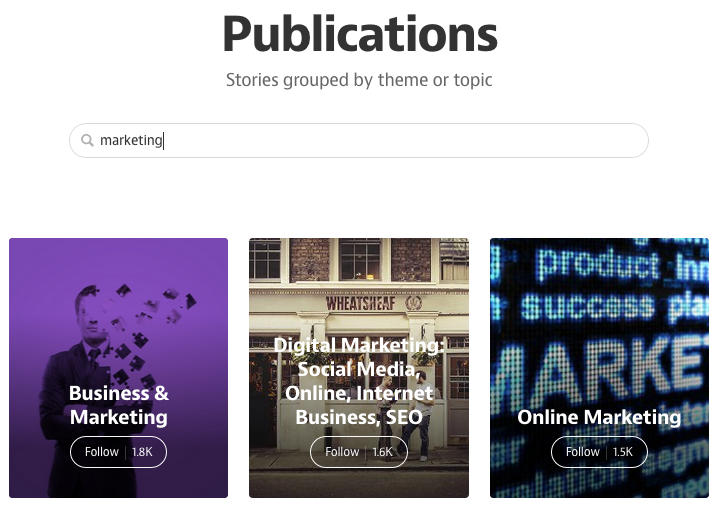 A recent update to Medium allows custom domains for publications. Brands, you’re welcome. Medium doesn’t serve as yet another distribution channel that reaches random masses, but as a channel that permeates a set of already niche audiences, doing the heavy lifting for you when it comes to targeted distribution. Here’s a closer look at the possibilities for content discovery either natively within their app or through their external communications. Comprehensive homepage: Not only does Medium show you an activity feed of what your personal network is up to, but trending tags and articles are displayed once you enter the app. Here, you can also easily access articles which you have bookmarked for later. Robust native search engine: When you plug in a search query, it allows you to sift through relevant stories, tags, people, or publications. Here’s what comes up when you search for ‘content marketing’. In-app notifications: Any new content that is published by writers you follow appears here. When people interact with pieces that you have written, you get notified of this as well. Email digests: These emails summarize the content produced by your first degree networks, in case you miss them in-app. Recommended articles: These suggested reads are from your second degree network based on what your friends are showing affinity for. The folks at Medium offer [four pro tips](https://medium.com/the-story/how-to-get-read-on-medium-aa88e30495a?source=1) to make sure your post looks its best, grabs people’s attention, holds it, and encourages them to pass it on. Beneath the simplicity of their Post Editor's design lies many, many [useful features and functionalities](https://medium.com/the-story/tips-and-tricks-for-medium-writers-1d79498101c3?source=latest#8bc8). Here's what you need to know to let you hit the ground running. Are you treating Medium as your writing portfolio? Here's how to put your best foot forward by selecting which pieces you want to be [featured on your Medium profile](https://medium.com/the-story/feature-a-story-on-your-medium-profile-83645843a050?source=1). [Find a publication](https://medium.com/the-story/medium-publications-8f086f8f282c?source=1) where you think your piece could thrive, and get in touch with the editor. If/when your piece gets that boost of exposure, you'll capture all the right eyeballs. Ensure your post gets discovered organically by [using strategic Tags](https://medium.com/the-story/introducing-tags-to-medium-1b6182fd3dbd). Featured image via The Physical Educator.